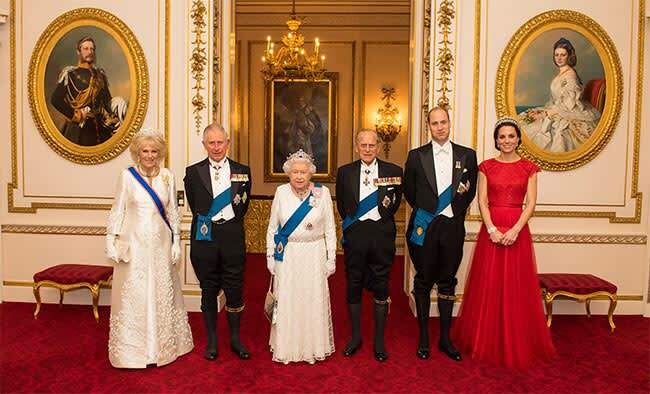 Kate Middleton and the senior royals' official portrait: their ceremonial dress explained | HELLO! The British royals donned their finest traditional dress for the annual diplomatic reception at Buckingham Palace on Thursday. An official portrait released from the event showed the Duchess of Cambridge, looking glamorous for the occasion in a red Jenny Packham gown and Princess Diana's Lover's Knot Tiara. She was joined by the Queen and Duchess of Cornwall who both also wore evening gowns, plus her husband the Duke of Cambridge, father-in-law Prince Charles and the Duke of Edinburgh who all looked smart in traditional outfits. Many royal fans have questioned the significance of their formalwear, including why the men wore breeches and what is the significance of the sashes and brooches they are each wearing. There is a lot of history to the pieces worn by the royals. The Queen wore her blue Garter sash which was pinned with her Royal Family Orders, featuring portraits of both herself and her late father King George VI, along with her Garter Star which was pinned to her Angela Kelly dress. The Queen's Garter Star is set with diamonds and was a gift to her from her father in 1947 when she was invested. It was originally a wedding gift to him from the Royal Navy. Meanwhile Camilla wore her Royal Victorian Order sash, to which she had attached her Dame Grand Cross of the Royal Victorian Order – a personal gift from the Queen. She also wore the Royal Family Order, a diamond encrusted miniature portrait of the Queen which is given to senior female royals. The Royal Family Order was first introduced during King George VI's reign and is typically worn by senior British royal women at gala events. It is believed to be one of the highest honours that the Queen can bestow upon the female members of the royal family, and is not yet believed to have been granted to Kate. Joining the line-up were Prince William, Prince Charles and Prince Philip, who were all dressed in knee breeches with formal jackets and shirts. All three men wore a Garter sash and a garter attached to their breeches, along with the Order of the Garter star, which is the most senior and oldest Order of British chivalry. The royal men each proudly pinned their medals to their jackets; while Prince William has two (the Queen's Golden Jubilee Medal and the Queen's Diamond Jubilee medal), his father has a number of diplomatic medals including the Queen's Service Order, the Queen's Coronation Medal and the Canadian Forces Decoration. The Duke of Edinburgh has an impressive 17 medals which include his own service medals from World War II plus the various Coronation and Jubilee medals he has acquired. Both he and his son also wore the Order of Merit around their necks. This red and blue cross worn on a red and blue ribbon is a dynastic order and personal gift from the Queen, and is restricted to 24 members. Their outfits were befitting what is known as one of the most important dates in the royal calendar, and marked the first time a photograph has been released from the reception.